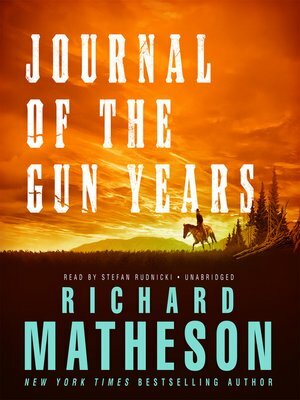 From New York Times bestselling author Richard Matheson, best known for his horror and fantasy writing, comes a highly praised Western that shows the master's hand in this genre as well. Back East, they told tall tales about Marshal Clay Halser, the fearless Civil War veteran who became known as the "Hero of the Plains" for his daring exploits in the Wild West. But the truth, as revealed in his private journals, is even more compelling. A callow youth in search of excitement, Halser travels to the raucous cow towns of the frontier, where his steady nerve and ready trigger finger soon mark him as a gunfighter to be reckoned with. As both an outlaw and a lawman, he carves out a legendary career. But fame proves to be the one enemy he can never outdraw—and a curse that haunts him to the bitter end.